I took this recipe from Twitter. @CookiesRecipes (www.bestcookierecipe.net) I have a scale so I weighed the 4 ounces of the instant vanilla pudding mix and it works out to be 3/4 cup. With my first batch of cookies I rolled exactly a 1″ ball and slightly flattened them. I cooked them for 8 minutes. The cookies came out too small and the bottoms were really brown. In the next batch, I made the cookies larger by 1/2″ and I really flattened them with my hand and they turned out way better. I’m not sure if they taste like the Subway version. (I may have to get some taste testers) I’d make these again regardless if they taste the same or not….these cookies are really good. 2. Combine flour and baking soda and set aside. 3. Blend together butter, sugars and pudding mix until smooth and creamy. 4. Add eggs and vanilla and beat well. Gradually add flour mixture to butter mixture. 5. Fold in chocolate chips and nuts. 6. Roll mixture into 1″ balls and flatten slightly. 7. Place balls onto ungreased cookie sheet. 8. Bake for 8 to 10 minutes. 9. Remove from oven and place on wire rack to cool. You HAVE to make these!! I am giving them as a hostess gift on Christmas Eve, but I wish I was keeping them all! This recipe was taken from a food blog called Culinary in the Desert. 2. In a small bowl, whisk together sugar, cinnamon and salt. 3. In a large bowl, whisk together egg white and Kahlua. Add pecans and stir well to combine. 4. Sprinkle half the sugar mixture on top and mix well. Pour the rest of the sugar on top and stir until completely combined. Scoop the mixture onto a large baking sheet lined with foil and coated with nonstick spray. Spread the pecans to an even single layer. 5. 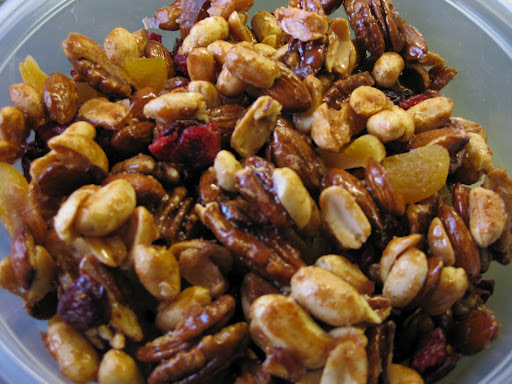 Bake until pecans are lightly toasted and browned, stirring every 10 minutes, about 20 to 25 minutes total. 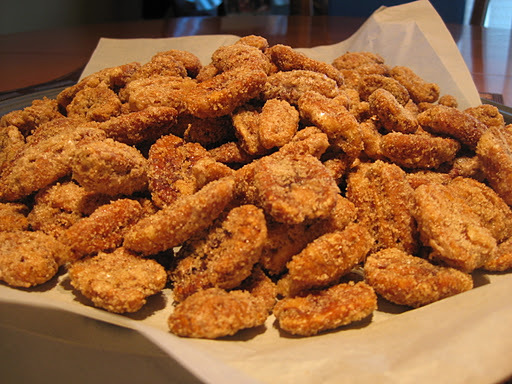 Remove from the oven and scoop the hot pecans onto wax or parchment paper to cool completely. 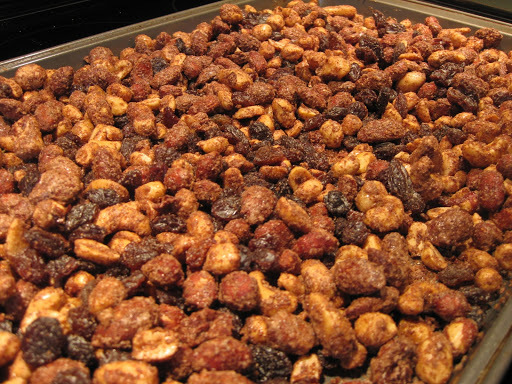 Your house smells so good after making these spiced nuts! The recipe is from Company’s Coming Appetizers edition by Jean Pare. 1. Beat egg white until smooth consistency. Add nuts. Stir to coat each nut. 2. Mix sugar, cinnamon, nutmeg and cloves together in small container. Stir into nut mixture. Spread on baking sheet. Bake in 325F oven for about 20 minutes stirring 2 or 3 times. 3. Remove from oven, stir in raisins and salt right away. Allow to cool. Store in covered container. Makes 3 cups.